Confrontation and Rag’narok merge into one game. It was very sad to witness the demise of Rackham, a French company that made spectacular metal miniatures, after its ill-advised switch to a new range of pre-painted plastic miniatures to support its two miniatures games AT-43 and Confrontation: The Age of the Rag’Narok. Yet the dramatic fall of the company has overshadowed how good these games still are, and, with a bit of retouching, how perfectly acceptable the miniatures are for gaming. I already have a huge collection of the scifi AT-43 miniatures and enjoy that game a lot, so I began buying into the fantasy game, which has a similar set of rules … and it wasn’t long before I was gobbling up a lot of the old metal minis as well to enlarge my armies. Here’s my rules summary, along with the game’s unit cards, redesigned in a similar way to how I redesigned the AT-43 cards. Here you’ll find complete sets of army cards for the five main factions: the human Griffins of Akkylannia and the Lions of Alahan, the predatory Wolfen of Yllia, the twisted alchemists of the Scorpions of Dirz, and the horrific Undead of Acheron (the Ram). The excellent Cory Gerleman gave me his invaluable help and valuable time in the making of this summary and these army card sets. Many thanks Cory. If you’re still playing Confrontation, enjoy! Here you’ll find all the original Rackham PDFs for the last version of Confrontation. Thanks for the cards. They will help game play for newcomers and veterans of the game. Confrontation: The Age of the Rag’Narok was where i started collecting Rackham miniatures. It is still a great game and now have alot of the metal figures also. Here too. Super large collection of Rackham. Finish painting the box set of goblins warstaff. Starting the dwarf clan box set. Awesome game/incredible sculptures. I have recently got into this game. I am thankful to people like you who benefit the gaming community at large. Thank you and take care! So have I—we’re probably bidding against each other on Ebay. 🙂 Glad you’re enjoying it! The extra profiles (and extra rituals, communions and artifacts) are all official, and come from the supplementary army lists that Rackham released to cover some of their older metal miniatures. thank you ; just for curiosity, where this supplements appeared? They are available out there on the web. I have all of them for each faction that Rackham made. They also released 4.0 style cards for each model they had. The file is quite large (over 100mb) but I am sure that I can put it up on my dropbox for you. You can shoot me a Geekmail at BGG at the same username as I posted here if you want them. I am not sure who hold the Copyrights any more. I THINK it is CMoN but they are supposed to be putting out a 4.5 or 5th edition (myself I like the ease of play for the 4th edition). Oh and UH Thank you so much for all he hard work you put into a dead game. I wish I could get more people to play both this and AT-43. I’m with you freaky undead baby pic person. They’re both great games and I really enjoying collecting and playing them. They may be dead but they live on! How does the perforating shot work again? It’s just what’s on the card (though I should remove that original reference to ‘the perforating shot rules’) – perforating shots can eliminate more enemies than there are marksmen. In ranged combat, usually a salvo cannot eliminate more targets than there were weapons used. Sorry a bit slow here, how does the ballista kill more people if it only has one shot? I’m a newbie to this game too so, in general, the best place for questions about it is probably Boardgamegeek. But if you need to justify the rule I would think the ballista arrow is so big and fast it goes through multiple ranks. Also, ballistae could fire both arrows and balls (the crew figures carry both). I have a question about FEAR. For example half of Guardians unit died in Wolfen Hunters attack. The unit should take FEAR 5 test. Does this mean I have to roll the dice and have natural 5 or more to stay in battle? What if unit has banner keeper (+2 to courage). Hi. Sorry, but there simply isn’t enough of a Confrontation community visiting this one page to answer specific rules questions. I’m sure if you post here someone will be able to help. Please let me share my Confrontation: AOTR Army Calculator with you. Please note I have found couple errors in following cards. Cloning Tank Unit. Cost of STD unit is 50ap and cost of the extra fighter is +75ap, but the max cost is 100ap. Looks like the extra fighter cost should be +50. “Everything looks right with what we have. Yes, it would seem that an extra fighter would be 50AP, but it is correct according to the official errata. I’m sure the added cost for ‘extra’ fighters was supposed to interact with abilities like the (Scorpion) Theben disadvantage: The standard and maximum number of fighters in infantry units is reduced by 1, with no change to the strategic values. However, the player may pay the cost of an extra fighter to reach the original number. not bonus dice, so they can be rerolled. I have tryed to find it in a Tample rulebook and didn’t find it. Can you please check if it’s correct or not? Just checked – it’s in the Griffin army book. Can anyone provide me a good army builder for confrontation, the one in open r community tools works fine with the at-43 data base but there seems to be a bug when confrontation data files are used. I have a simple Numbers/Excel spreadsheet that I use to keep track of my armies that has a calculate function—nothing fancy but it does the trick. Would that help? Yup that would do it. thanks. There you go, added. Not all of the extra units are included (ie the ones in the extra lists that covered older models). The only thing it does automatically is add up the last right hand side column of total points. There are also some sample army lists I’ve been fiddling with included, but they’re tailored to my personal collection (as is the whole thing, really, but you may find it useful). The link for the army cards are not working. Getting 404 page not found. Love confrontation 3 and 4 edition. Glad to find this site and have both of Rackham games. Really awesome. Huge work on the metal miniatures, big collection and slowly armies are getting ready for battle. Was lucky to find all the rules, cards and a.p. value for all the armies (metal and plastic) in 4th edition. Huge universe and sad never saw the light. May be some day. I still enjoy adding more metal miniatures to my armies, it’s my fantasy miniatures tabletop system of choice. I JUST started picking up this game because I found some of the stuff dirt cheap. I feel extremely lucky that I happened to pick up the same discontinued minis game that UH did, because all of this is a huge help. Thanks, UH! 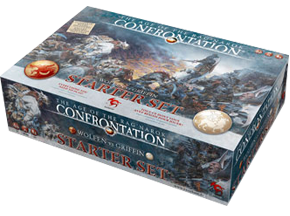 Confrontation AotR is my favorite miniatures game of all time and I played it all the time during its days. I hope you don’t mind that I them advertise for a game called Drakerys that’s coming out later this year. The rules seem super similar and so does the art. I for one will be using my old confrontation collection for this game. Great work Univetsal Head. Always brings me great joy to find people that enjoy this great game! Drakerys looks interesting, I completely missed that Kickstarter campaign. Looks like they lifted that universal action table idea from Confrontation! I like the scenery they’re making, though it’s pricey. Wish they’d make the rules available for download. Anyway, it’s a nice looking game, I’ll keep an eye on it. I had a look at the Drakerys gameplay videos, and I must say that really is a big copy of Confrontation’s universal action table system. The game seems targeted to a bit of a ‘beginner’ demographic, but the miniatures and production look nice. These cards are extremely helpful, the game to run fast because they have all the details on them. This is MY BEST FANTASY wargame and it scales great from small to bigger army. I see a lot of different rule sets out there, what should I be using with these cards and mini’s? Err, it’s a rules set of its own: Confrontation: The Age of the Rag’Narok. You could use the minis for anything I suppose, but the cards are designed for that game. Ahh, Thank you. I don’t have the box, just mini’s and your cards so I am trying to find the rules to use. I think you can find a PDF online somewhere (the game is now defunct), but my rules summary pretty much covers everything essential. Good day. I have just now discovered this post, and i love that there are onfo for the game! I have bought sooo very many of the confrontation minis, and would love to get into this game. I notice however, that there are only cards for some of the factions. These are all released? But thx for getting me interested in confrontation again! Hi Otasolgryn. All this information is for the 4th edition of the game, so all the factions that were represented in that edition are here. Unfortunately I don’t have any support for earlier editions and their armies. Happy gaming! Hey guys, I was hoping to purchase some of the last Lahnar’s Paladins of the Lions expansion for me and a friend on miniaturemarket.com, but they recently have been sold out. Do you know of anywhere I can purchase two of these packs? Brian, if I had a secret place where I could still get Confrontation figures, I wouldn’t tell anyone about it! 🙂 Ebay is probably your best bet. PS I’m working on a revamp of all these unit cards at the moment. eBay for sure if you want to get the minis, but they really should rename it FLEECEBay for the prices they are asking! I spent quite a bit building up good-sized armies for all 5 factions about 2-3 years ago, and enjoyed the collectable aspect of doing that, but there’s so little left and prices are so high that I think it’s probably too late to do that now without a silly amount of disposable income. Too true, that. It’s sad, but… eBay is no longer the place to find stuff at a decent price… or rather, it’s getting harder and harder to find. The card lists are awesome…. Is there any way of easily making a printer friendly option? Also.. maybe I am missing it but do you have any sort of checklist for what was actually published so I can figure out what (if anything) I still need to track down? Thanks so much for these awesome things as always! – If you mean B&W by ‘printer friendly’, no. I suggest you print in greyscale using the options in your print dialog. – Everything that is in the army unit cards files are what was released. Some figures were in plastic (the pre-painted plastic released with this 4th edition), some were in metal (the older figures given 4th edition stats), but I cover every figure that was given statistics for this last version of the game, both in the army books and the later extra PDFs that (roughly) gave stats to older metal minis. – Just a note that you might find it very difficult (and expensive) to track down decent armies of these figures these days. – I’m still working on an updated v2 of the unit cards, but it might take some time as it’s a mammoth job. Griffon and Ram are just about done, but I haven’t started on the other 3 factions yet. Keep this in mind if you print out all the cards now and print costs are a big issue for you. Sorry, I can’t give you exact timelines on when these will be finished. By printer friendly I actually meant more effective use of the space on a page. I was going to print on card stock and wanted to have minimal waste. Ink wasn’t my concern when I asked that question. I understand a lack of a concrete timeline.. .life tends to get in the way! haha. I actually have most of the 4th edition now. I was just trying to figure out how much of it I was actually missing. Yes, that aspect of the design has been improved a lot in the v2 files. I can post up Griffon and Ram but the others will take a while yet – they’re very, very fiddly and time-consuming projects. Glad to hear you’re playing the game! thank you so much for your hard work. i have downloaded the card files and the army tracker spreadsheet, but when i click on the rules summary, it gives me a 404 – file not found error. Note – if you’re about to print them, note that v2 of the Griffin and Ram cards are coming soon. thank you for fixing that link. these really are great. my friend and i decided to dust off these great miniatures and give it another try. our armies are as complete as possible. we are the small minority that LOVED the idea of pre-painted minis. I like to play games, i do not like to model. thanks for keeping this resource alive. Hi UH… many thanks for the rules and cards. I’m about to give Confrontation a try. But I’ve 1 question and 1 suggestion. Question: what’s the size of the battlefield? The rules don’t say (or I’ve not been able to find it). I’ve seen online some folks saying it’s 4 x 4 and some say 4 x 6? Suggestion: For the Incarnate cards, would it be possible to add info for “Unit formation” : “[Incarnate] can join any [army] unit”? I think that’s the only bit of info missing from the cards. i don’t think that the size of the battlefield matters too much, as long as you have the 30cm “neutral zone” that separates deployment zones. my friends and i play on a table that is approximately 5′ x 5′, and our games have been great. We’ve played 6×4, but it depends on the size of your armies I suppose. Thanks for the replies. My largest table is a 4 x 4 (for Wrath of Kings) so I guess I’ll have to limit my army sizes to what would work best on a table that size. Question: is there a list of errata or FAQ’s that you are pulling this information from to make the cards? we came across an artifact last night that has different values on the cards. “Seal of Verion” is a reserved artifact for Melkion (Lion Incarnate). the cost of the artifact in the book is zero, but costs one on the card. the cost to use the seal’s spell is five mana in the book, but zero mana on the card. I assume you mean Meliador? You’re correct, that’s a mistake. If you ever find any more, let me know. This was a huge project, and while it was proofread many, many times, errors still get through. There were army book addenda and an overall errata, and these rules and cards take them all into account. I’ve now made them available here. yes, Meliador. i was pulling that information from memory. thanks! THANK YOU for all the new stuff added! Lion almost finished. Then it will be Scorpion, then Wolfen. It’s a hell of a job which I have to do slowly, or it gives me RSI – I’m not kidding! Having done the Scorpion –> WoK total conversion cards… I know what you mean! I recommend waiting until they’re all done before doing a big print out though, as I’m finding little fixes here and there as I go. This is awesome. I just have to say that again! Now I just need to figure out what all I still need to track down. haha. Hey UH…Okay, I took the confrontation plunge a little while ago. And you know, I can’t not make the units I don’t have so I started making Scorpion’s Jadharis Clones out of extra skorizes (I would send pictures but for the photobucket thing). I was bashing away on the special fighters and was wondering what their abilities were so I checked your (most wonderful) cards and noticed that their card has the text for neuromancer in place of the Geno-Technician, the musician and the standard bearer (typo or maybe you don’t have their abilities?). I have tried to find it elsewhere but am having no luck. Do you have the abilties of those three special fighters? They are close to done and I want to introduce them to the wolfen. No, can’t say I have.